So, my plan for the next few weeks is to teach 7 basic meals using a systems focus.Â We will talk about soups, curries, pizzas, salads, rice and beans, tacos, and stir fries.Â The goal is to give you a meal for each day of the week that you can confidently play with using the ingredients you have on hand.Â The meals will be cheap (less than $15 to serve 4 people), easy (done in 30-60 minutes), healthy (whole grain and light on meat), family friendly, and flexible for many types of ingredients.Â Because once you know the method for a stir fry or a hearty soup, you can rework it endlessly and never get bored with it.Â And the “recipes” may not look like my normal ones (and may seem longer because of it).Â I will try to focus on listing the ingredients, but not indicating how to prepare them in the ingredients list (e.g. I won’t write “2 onions, finely chopped”).Â Instead, I will work the preparation into the directions so you can save time by chopping onions while water is coming to the boil, etc.Â Mise en place is necessary for a restaurant kitchen, but it’s not always realistic for the home cook who is trying to get dinner on the table while doing third grade homework with children hanging off his/her legs. I think by giving you models and showing you how I would actually cook a meal like this with logical instructions, rather than recipe notation, you can increase the repertoire of meals you cook on a regular basis and start to cook based on intuition rather than following a recipe word for word.Â And when you get to that place, I can almost guarantee that you will begin to enjoy cooking more because it becomes an expression of creativity and more of a challenge.Â So, our first recipe in the “Cuizoo Arsenal” is a Crispy Calamari Chopped Salad. A main course salad like this needs only a few components:Â salad greens or cabbage, some protein (fish, chicken, beans, or tofu all work), extra chopped veggies, some nuts or seeds, fruit or cheese if you like, and a dressing.Â Use the veggies that you have, or the ones that your family loves the most.Â We like chopped salads with a creamy dressing, but feel free to use a vinaigrette too.Â Making your own dressing takes all of 1 or 2 minutes and is so much more flavorful and healthy than a bottled variety (Here’s my recipe for Balsamic Vinaigrette which you can leave as is or tweak with herbs, mustard, etc. ).Â In this salad, I lightly fried our calamari, but it would be equally good sauteed or grilled if you don’t feel like frying.Â And this easily feeds 4-6 people for less than $15. Variations I could easily envision would include a Leftover BBQ Chicken Salad with greens, thawed corn, avocado, tomatoes, Jack cheese,and a creamy cilantro dressing; a Turkey, Dried Cranberry, and Pecan Salad with greens, carrots, celery, chopped apples, white cheddar cheese, and an Apple Cider Vinaigrette; a Vegetarian Greek Salad with greens, chick peas, roasted red peppers, green onions, feta cheese and a basic Greek Vinaigrette; or a Pizza Salad with greens, peppers, tomatoes, torn basil, some crisped prosciutto, rustic croutons, mozzarella, and a Basil Vinaigrette.Â The key is to take flavor combinations that you enjoy and convert them into a salad. I’m looking forward to this challenge and I hope it gets you in the kitchen more in 2011! 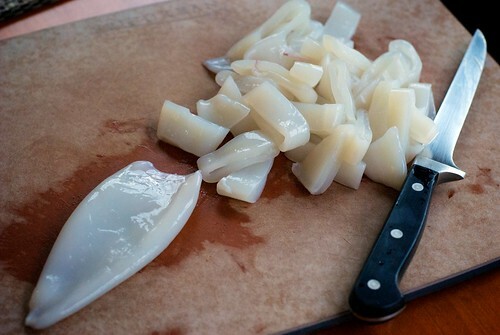 1.Â Preheat the oven (or toaster oven) to 400 degrees Fahrenheit.Â Clean squid bodies by making sure there are no remnants of cartilage, etc. inside the pouch.Â Slice in thin rings and toss with juice of 1/2 of a lemon, salt and pepper, and a bit of smoked paprika.Â Let marinate while you prep the veggies and toast the pumpkin seeds. 2.Â Put pumpkin seeds on a baking sheet and toast for 10-12 minutes in preheated oven. 2.Â While pumpkin seeds toast, place salad greens in a salad spinner or bowl to wash.Â Meanwhile, wash cucumber and slice in half lengthwise.Â Using a spoon, scrape out the cucumber middle to remove the seeds.Â Cut the halves into quarters lengthwise and cross cut to make bite sized pieces.Â Wash the tomatoes and set aside. Wash and trim radishes, quarter them, and chop into bite sized pieces.Â Remove the salad greens from their rinsing water, and spin or towel dry. Tear dry salad greens into bite sized pieces if necessary and place in a large salad bowl with chopped cucumbers and tomatoes. 3.Â Finely chop onion and parsley for dressing.Â Make the dressing by combining mayo, yogurt, milk, relish, onion, parsley, salt, cayenne pepper, and black pepper.Â Thin with a little leftover lemon juice if needed.Â Place in refrigerator until you are ready to serve. 4.Â Preheat a large saute pan with a thin layer of olive oil in it over medium high heat. On one plate (oven safe), place a double thickness of paper towels and set aside. On another plate, mix cornstarch (or arrowroot) with some salt, pepper, and a bit of smoked paprika or chipotle powder.Â Â Take about 1/3 of the calamari rings and dredge in the cornstarch or arrowroot mixture.Â Shake off excess and lightly fry in the preheated saute pan.Â They will take only about 1-2 minutes per side.Â When they start to look just golden, flip them with tongs and cook about 30 seconds more. (Don’t overcook your seafood! )Â Remove with a slotted spoon and place on paper-towel lined plate and stick it in your still warm oven (shouldn’t be on, just warm from toasting the seeds).Â Repeat with the remaining calamari until it is all fried (if you need to, add a bit more oil to the pan).Â When it is done, remove the warming plate from the oven and toss the calamari with a bit of salt and more Smoked Paprika or Chipotle Powder. 5.Â Assemble the salad by tossing the vegetables with most of the prepared dressing (reserving about 1/4 cup).Â Mix in pumpkin seeds and either place on a platter or leave in a large bowl.Â Top with Fried Calamari and serve with additional dressing if needed. Looks delicious! I also only eat squid bodies and DETEST the tentacles. And I will definitely be using this recipe!